A minimum of 20 Swifts in the sky from points West of Burton Memorial Hall. Thursday 23rd July 2015 - Swift observations - Off Main Street, Burton In Kendal 2000hrs to 2100hrs. It was clear and reasonably warm, the birds of which 8 was the maximum count and would be at a average altitude between 75 and 150ft. We just caught them twice doing the follow my leader screaming flight. As usual we took it that the birds flew bias to their breeding areas and could be seen high in the sky. Tonight there were two observers David Craig and Bryan Yorke. We started at the Cottage near the Post Office and were lucky to actually see one fly into the nest, we did hang fire for a few minutes but never saw it leave. Then on to Cocking Yard with no activity witnessed. We moved further on to the Royal, observing all elevations. 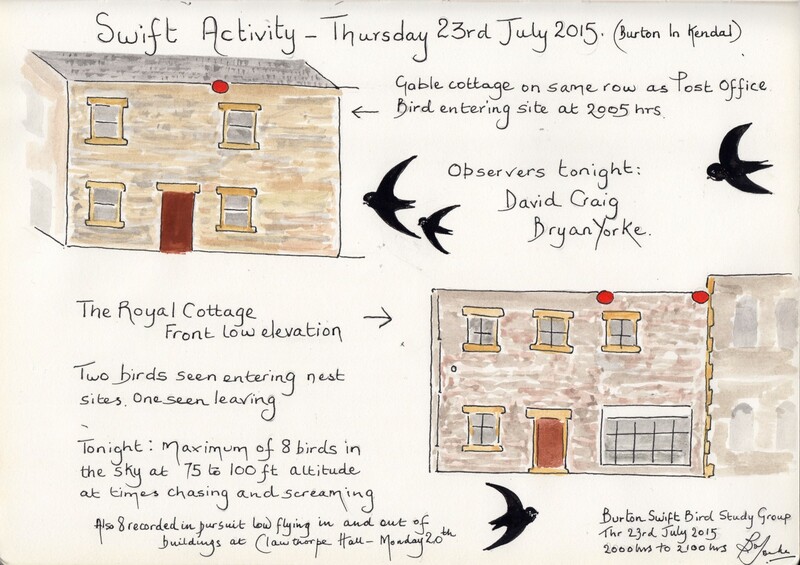 But tonight the only activity here was on the Cottage front low elevation where we were fortunate to witness two birds coming back into their nest site. One bird left again within minutes of landing. We gave equal amounts of time to checking the large building behind the old bakery (from the back of the King's yard) and we then went on to observe the Coach House and the Manor House, with no further sightings of birds whilst observing. Just to add I had a party of 8 birds on Monday last the 20th flying low in "follow my leader fashion" going at low levels in and out between the buildings at Clawthorpe Hall.